This new gaming notebook features an Intel Core i7-4700MQ processor, two NVIDIA GeForce GTX 765M GPUs, 16 GB of memory and 17.3" Full HD display. CyberPowerPC, a manufacturer of custom-built gaming PCs that has been around for over a decade, announced the release of a new gaming laptop, the Fang Taipan M2. 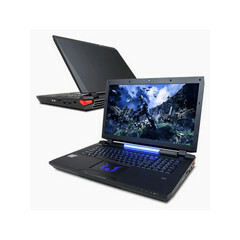 According to the press release, the M2 is nothing less but "the ultimate gaming laptop that can be customized for every buyer with the latest in gaming tech," even the base model packing quite a punch. Based on the Clevo P375SM barebone, the Fang Taipan M2 is powered by a Quad-Core Haswell CPU (Intel Core i7-4700MQ running at 2.4/3.4 GHz, with 6 MB of cache memory), together with a high-end DirectX 11 solution for laptops, namely the NVIDIA GeForce GTX 765M SLI. The memory capacity is exactly 16 GB (a pair of 8 GB DDR3 SODIMM modules working in dual-channel mode), while the storage space available consists of 64 GB offered by a SATAIII SanDisk SSD and the generous 750 GB provided by the 7200 rpm HDD. On the outside, we have an illuminated keyboard, two webcams (5/1 MP), a fingerprint sensor and the 17.3" Full HD display. Running the 64-bit edition of Microsoft's Windows 8 operating system, the Fang Taipan M2 also includes more common features, such as the 802.11 b/g/n Wireless LAN + Bluetooth combo or an 8X DVD±R/RW/4X + DL Super-Multi Drive. Priced at $1,869 (before all applicable rebates) and estimated to ship on the 13th of this month, the Fang Taipan M2 can be turned into a real monster by choosing options like the Intel Core i7-4930MX Extreme processor (add $876 to your price) or the NVIDIA Geforce GTX 780M SLI ($768 more).